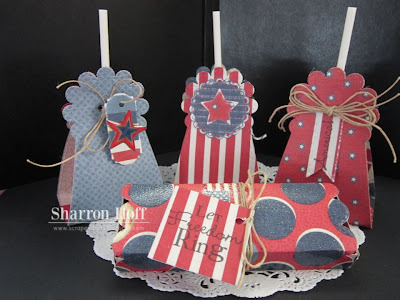 My Creative Time: HAPPY 4TH & WINNER (S) for my "500th" Video! GOOD MORNING my sweet creative friends! Before we get to the winners, I wanted to say "HAPPY BIRTHDAY AMERICA! Today I am sharing a SUPER CUTE "Patriotic" tag for you! 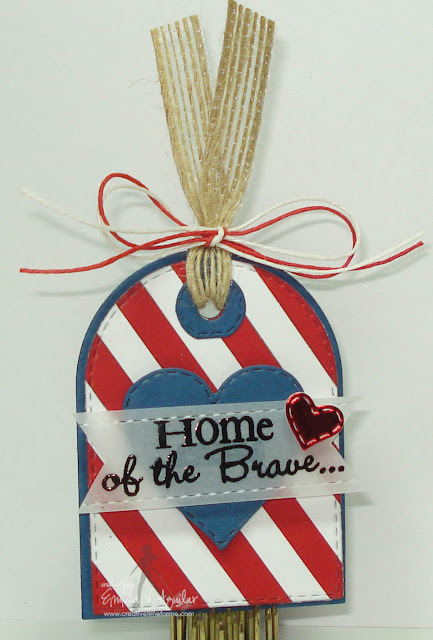 In honor of 4th of July, I was anxious to make this! It ended up coming out way better that I have visioned it in my brain! lol..... You can see in my video below exactly how I made it using strips of paper & vellum to create my background! Here are some SUPER SWEET treat holders made by our very own Miss Shar! Visit her blog HERE to see details! Love to win...thanks for the chance! Love the background stamp...fab clouds!! Congrats﻿ on 500 videos...wow! Emma congratulations﻿ on your 500th video!!! Your videos are amazing my friend! Love the new stamp too!!! Gorgeous stamp that I must have! CONGRATS TO ALL 3 Winners! Please email me your addresses to: info@my-creative-time.com so I can get your prizes mailed to you asap! ***My design team has taken the week off to prepare for our BIG release next week! I am SO EXCITED because we have some FUN stuff headed your way! I am going to do something different this release. Since I have been getting SEVERAL emails regarding a new release, I thought it would be fun to let you PRE-ORDER the release starting on Wed, July 10th! BUT, here is the BONUS part, you will be able to see the ENTIRE release that day! Isn't that EXCITING??? We will still proceed w/the sneaks as usual so you can see how each new product can be used & get TONS of inspiration for when your stamps/dies arrive to you! Happy 4th Ms Emma! Didn't win, but Congrats to the three of you lucky ladies! I am looking forward to your new release! I just LOVE all of your stamps & dies! Enjoy the 4th and look forward to the 10th! WooHooo... thank you Emma and everyone! I am super excited to have won. Emma, I emailed you my information. 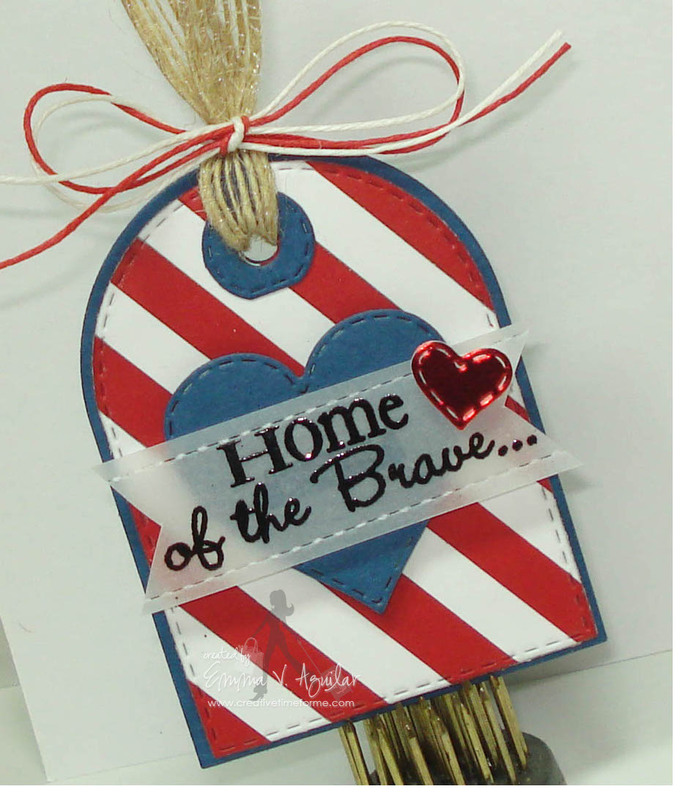 Beautiful July 4th tag!! I absolutely love how you made the strips on a slant and love the stitched look. The vellum is beautiful especially when stamped on and I must get me some of that clear pop ups! I couldn't even see it under that velum piece! Again thank you for picking me and I hope you and your family have a wonderful and happy July 4th! Congrats to the winners. Can't wait to see the new release projects! I just LOVE your tag!! Gorgeous job as always Emma!! Wishing you a Happy 4th of July!!! These are sooo awesome! LOVE your tag!! Can't wait to see the new release! Happy and safe 4th!! Congratulations to the winners! Way to go! Happy 4th of July! Congrats to the winners. So looking forward to see what's new! Happy 4th to all, be safe. Congrats to ALL the winners! That is so SWEET that you added a Bonus prize for another winner! !A Gorgeous Tag and Super Cute treat holders. Love your products and can't wait for the new release!! Happy and blessed 4th of July!! I would have loved to have won this amazing stamp.....but oh well!! Congrats to all the winners!! and it's a good idea to let us pre-order on Wednesday! can't wait to see what's in store for next week! thanks and enjoy your weekend! What a great tag. Happy 4th of July. Happy 4th of July to everyone! Congratulations to the lucky winners...enjoy! Congrats to all the winners! Your tag is adorable! I hope you and your family have a wonderful and safe 4th of July! Congratulations to all the winners. Hope you had a great 4th! Look forward to your release! CONGRATS on your 500th video!!! I am so happy I found you way back in 2010! I just have enjoyed watching your videos, seeing your creations and all hearing about all these fun techniques! Thank You! You are so super talented, creative and just a sweet & caring person! CONGRATS to you and the winners! Oh LOVE how you did that tag!!! Plus ALL of the treats containers!! !